Environmental sustainability is a highly politicized term which almost all nations now eagerly claim as one of their goals. How true are these claims? The Environmental Sustainability Index (ESI) combines five major components (see diagram) which include 76 separate measurements in all. It assesses how close countries are to environmental sustainability. The ESI includes the ecological footprint but also looks at levels of pollution, susceptibility to environmental disruptions, the effectiveness of environmental policies and each country’s contribution to global stewardship. Comparison of ESI components for Mexico, USA and Canada. (Geo-Mexico. Figure 30.5) All rights reserved. The countries with the highest ESI scores are predominantly resource-rich nations with low population densities, such as Finland, Norway and Sweden. Some small wealthy states such as Switzerland also make the top ten. In general, densely populated countries such as India and Bangladesh do not score as well. Mexico’s low ranking in the pilot 2000 ESI table led to Mexico’s Environment Secretariat (SEMARNAT) exploring ways to ensure that international organizations such as the World Bank and World Resources Institute had faster access to updated data from Mexico. Government policy was modified to embrace the use of quantitative environmental data relating to sustainability. In terms of global stewardship, Mexico and the USA are closer to the target for environmental sustainability than Canada (see diagram). 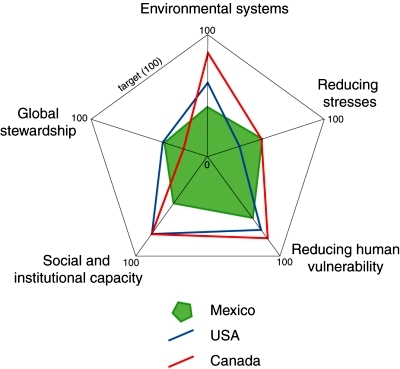 For reducing environmental stresses, Mexico and Canada are ahead of the USA. However, for the other three components, Mexico lags well behind both its North American partners.